St. Martin's Press, 9780312342036, 304pp. From the beloved #1 New York Times bestselling author comes an intimate look at the driving forces in one man’s life. With Augusten's unique and singular observations and his own unabashed way of detailing both the horrific and the humorous, Lust and Wonder is a hilariously frank memoir that his legions of fans have been waiting for. His story began in Running with Scissors, endured through Dry, and continues with this memoir, the capstone to the life of Augusten Burroughs. Augusten Burroughs is the author of Running with Scissors, Dry, Magical Thinking: True Stories, Possible Side Effects, A Wolf at the Table and You Better Not Cry. He is also the author of the novel Sellevision, which is currently in development for film. The film version of Running with Scissors, directed by Ryan Murphy and produced by Brad Pitt, was released in October 2006 and starred Joseph Cross, Brian Cox, Annette Bening (nominated for a Golden Globe for her role), Alec Baldwin and Evan Rachel Wood. Augusten's writing has appeared in numerous magazines and newspapers around the world including The New York Times and New York Magazine. In 2005 Entertainment Weekly named him one of "The 25 Funniest People in America." He resides in New York City and Western Massachusetts. In which ways throughout the book do you feel Augusten has self-sabotaged a relationship? Have you experienced this in your own life and what do you think are the internal reasons for this in Augusten's case and in your life? What are your favorite revelations, passages, and/or scenes in Lust & Wonder? What are your feelings about the developing relationship with Christopher, mixing professional and personal aspects? Have you experienced this in your own life? 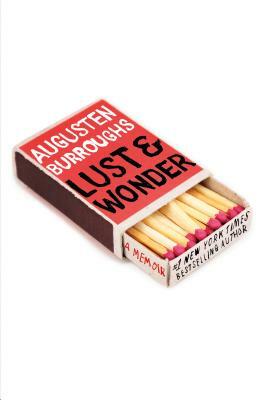 Some have referenced Lust & Wonder as the answer to their questions about Augusten’s life in the years since his last memoir, Dry. After reading it, do you feel the same? Upon revisiting Running with Scissors and Dry, what are the major ways in which Augusten's life perspectives have changed in Lust & Wonder? And in what ways has he remained the same? On page 106, Augusten tells himself: "Stop being so damn you." Think about other instances in the book in which Augusten's inner negative voice takes over. How do you handle the negative voices in your head? In Lust & Wonder, Augusten travels from San Francisco to New York to Massachusetts and more, fashioning a home for himself in each place. How does each location change him? Where do you feel most at home, and how do you make yourself at home when locations change? Discuss how Augusten, against all odds, found people who believed in his raw talent, from his first copywriting job to his debut novel, Sellevision. Talk about a moment in your life when you fought the odds and won. Augusten details his long history with therapy, whether individually or as part of a couple. Do you think autobiographical writing can act as a form of therapy? If so, how? As a writing exercise, try to pick a relationship from your life to write about in Augusten's candid, uncensored style. Without this filter, what comes up in your writing? How does it change your perspective on the moment you chose to write about? If you're comfortable, share it with the group and get their reactions! How does 20/20 hindsight change your retelling of your experiences? How do you think this memoir would be different if Augusten were writing at an earlier stage in life, say, 10 years ago?